The Pirates were coming off a three game sweep at Milwaukee but came up short in last night’s opener of a three game set at home against the Cubs. I think the hosts are looking good to execute revenge tonight though as they send Francisco Liriano to the hill. 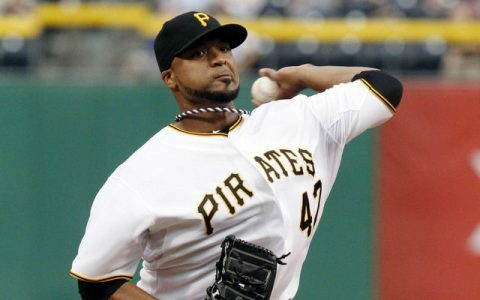 The Pirates have lost each of Liriano’s two starts this year despite terrific performances from the southpaw. He’s allowed only three runs on six hits over 13 innings and we can expect another strong performance here as he posted a 1.20 ERA in 15 innings over which he retired 23 batters against the Cubs last year, and the Cubs are 1-7 in their last eight games when facing a left-handed starter. The Cubs will counter with Travis Wood who’s had a strong start to the season as well, posting a 2.31 ERA over two outings. His record against the Pirates is not great though, and he struggled immensely last year allowing 13 runs on 26 hits with nine walks over 19 innings. Andrew McCutchen is 7-for-27 with two homers against Wood lifetime and is coming in hot going 5-for-15 over his last three outings overall. The Cubs have lost four of Wood’s last five starts at Pittsburgh while the Bucs are 6-2 in Liriano’s last eight starts against the Cubs. Mike Lundin is coming off a SOLID 4-1 MONDAY OVERALL and is an ASTONISHING 8-1 FOR THE NHL PLAYOFFS 2015! He’s back with a healthy card Tuesday, and the only way to ensure you get all of Mike’s plays is to sign up for aDaily/Weekly/Monthly All Sports All Access Subscription. With a massive profit haul underway, can you afford to hold off?